“Queen of the Desert” chronicles Bell’s journeys of love and loss in the Middle East during the early 20th century. Academy Award winner Nicole Kidman stars alongside Academy Award nominated James Franco, Golden Globe and Emmy Award winner Damian Lewis, and Robert Pattinson. The story began when a curious and adventurous young woman was eager to explore the world outside of England, Gertrude Bell (Kidman) and went to the British embassy in Tehran where she quickly falls in love with a secretary of the embassy, Henry Cadogan (Franco). This sparks the beginning of a life-long adventure among the beautiful but misunderstood people and cultures of the Middle East. Along the way, her path intersects with archaeologist T.E. Lawrence (Pattinson) also known as Lawrence of Arabia, and Major Charles Doughty-Wylie (Lewis), the British Consul General in the Ottoman Empire. 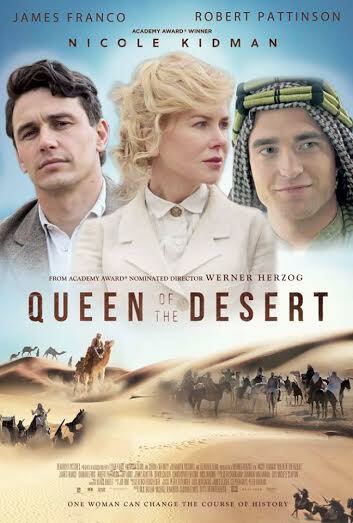 “Queen of the Desert” is written and directed by Werner Herzog. “I call it Werner World. Werner World is just a different realm. It’s glorious. I said to him, ‘Werner, I feel like I’ve been in a dream with you for the past two-and-a-half months, and now I’ve got my feet back on earth.’ I’m at a place where I’m so interested in exploring things and going places that I haven’t been. I want my life to be full, so that means all of us – my family – up and moving to Morocco and doing this so we can have the experience,” shares Kidman on working with the director. As Kidman discovered that while Bell was a true trailblazer in a time when women were not treated as equals, especially in politics, she also had ambiguous aspects. “There’s an interesting fact about Gertrude though, is that she was not a supporter of the suffragette movement, so that was fascinating,” says Kidman. Her extensive research of Bell enables her to bring a realistic and nuanced performance to this legendary character. Log on to www.sureseats.com for schedule and online ticket purchase of Ayala Malls Cinemas movies.